The Monthly Expense Checklist is the best way to budget your money on a monthly basis. The free template has everything you need to customize the items listed to suit your unique lifestyle and enter your finances quickly and easily. You will simply enter all your expenses for the month (the template gives you many examples), and the template will automatically calculate your totals for the month so you know exactly where you stand financially. This template is simply the best and cheapest way to stay informed about your finances. To download the document, click the link at the bottom of your screen. Start by entering your net annual income in the indicated area at the top of the page. Note: you will only have to enter information in the areas highlighted in blue. Keep in mind, if you have multiple sources of income for your household, such as a spouse’s income or government funded programs, you can just add them to one figure. The next step is to go through each of the categories for your expenses. 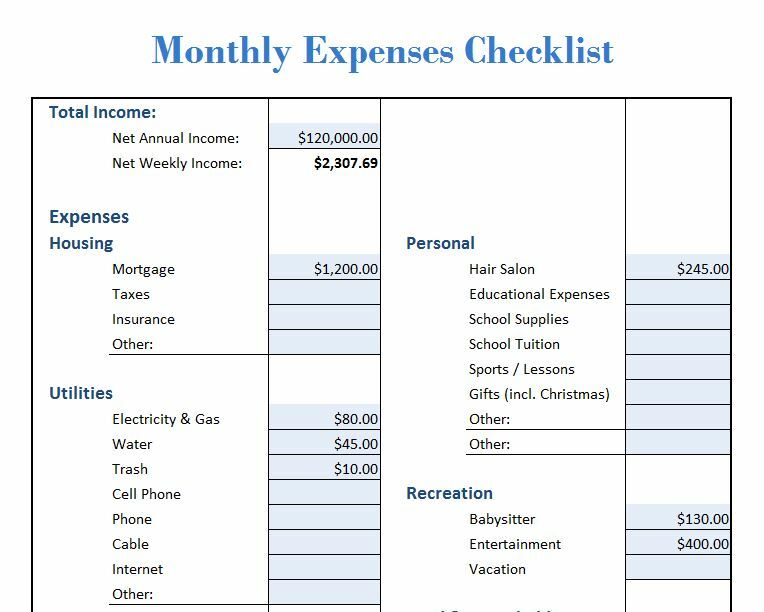 The Monthly Expense template has conveniently listed the most common expenses people have, such as utilities, rent/mortgage, etc. but you can easily change these by clicking inside the cell and writing something new. When you’re finished entering all the categories for expenses that you commonly use, go through and fill out each section with the amount you spend monthly on each item. If you scroll down to the bottom of the page you can see a comprehensive overview of all your expenses and income items displayed in the totals sections. In this area of the Monthly Expense template, you can see the sum total of all your expenses and how they compare with your income. Using this template, you can adjust your spending habits to save more each month.